Every university/college will be allowed to send a total of 3 boats to the Championship. Please register all 3 teams by Wednesday, May 8th. By submitting this entry form, I hereby agree that I have read all the event rules and agree to follow said rules. Also by submitting this form we agree that we understand participation in bass fishing contains inherent dangers, for which we accept all risk and liability. We agree to hold CarecoTV, The Association of Collegiate Anglers, The Bass Federation, and all agents and associates of said entities harmless from liabilities that may arise from participating in said event. 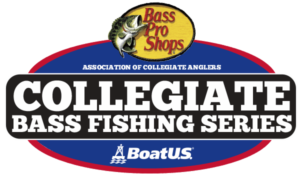 We also agree that our images and likeness may be used in promotion and production of the Cabela's Collegiate Bass Fishing Series, Association of Collegiate Anglers, CarecoTV LLC and all supported events and programs. This event is considered an individual event. All anglers fishing the event must register online before the cutoff date.